Our most powerful Ceramic Tab Resonator. Use it where focused energy is needed. Well-suited to clear most harmful EMF related energies from normal appliances. You can also clear harmful radiations, caused by grounding household appliances to water pipes. Attach to top center on gas or electric water heater with white dot pointing North. 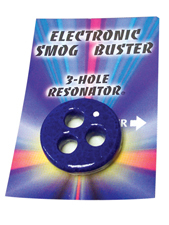 Specifications: 3-Hole Resonator is approximately one inch in diameter and made from a unique space age ceramic. Warranty: The manufacturer will replace any defective product at no additional charge. This product does not wear out or require recharging. Return Policy: In the event the unit isn't working out for you, you may return it within 2 weeks of purchase. You must contact our Customer Service Department for a return authorization number. Complete the return form that was sent with your invoice. Be sure to include any materials you received, such as the instruction booklet, as well as any parts that may have come with the unit. All units must be put in a separate box so that there are no shipping labels or writing on the original packaging. We suggest you insure the package and all return shipping charges are your responsibility. Upon its return, the unit will be inspected, and if it is in resellable condition we will credit you back less a 10% restocking fee. In the event the unit is damaged or defective, please save all packing material and contact our Customer Service Department immediately for further instructions.